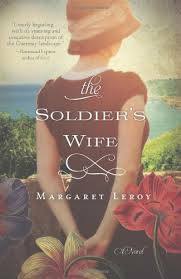 Review: 'The Soldier's Wife' was one of my most anticipated reads this year. While it was beautifully written, I felt the 'story' was lacking. Vivienne's husband is away at war and she decides to stay on the small island of Guernsey with her daughters. German soldiers move in next door and Vivienne embarks on an affair with one of them. I was expecting an intense, forbidden love...in reality they had a conversation (maybe two) and next thing you know they are in bed-in her house. It was just so unlikely this would have been kept secret for any length of time. The ending wasn't a shocking at all and I find it surprising she would have stayed on the island or been accepted by any of the residents. She didn't have much of a spine throughout the book although she did finally come around toward the end.